As ParrotsDailyNews.com was out of service during summer holiday we couldn’t inform you about a very important event of European aviculture. Association for the conservation of threatened parrots works with several species which are on the edge of extinction in the wild or are already extinct. So it was just a matter of time when the Lear’s Macaws will be also added on that list. According to the latest research news, there are roughly about 1300 individuals left in the wild. 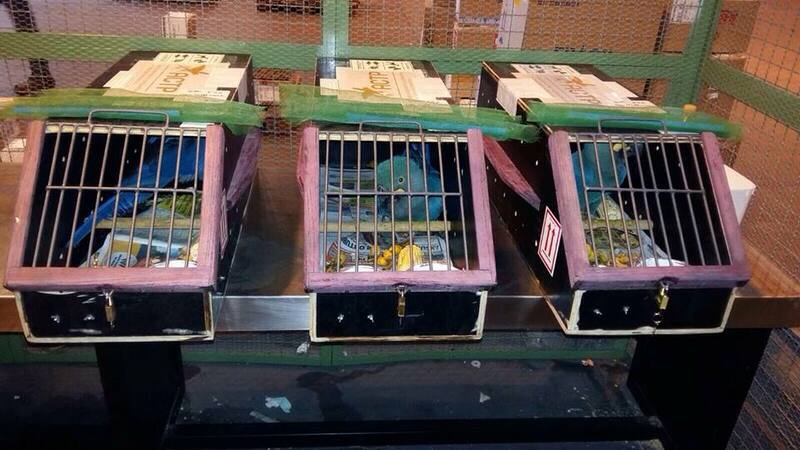 A month later, ACTP informed about the first Lear’s Macaws which arrived to Berlin on 16th July. It’s interesting to know that this is for the first time after more than 60 years when Lear’s Macaws are kept in Germany. „Under the patronage of the Brazilian government and together with our partner AWWP (Al Wabra Wildlife Preservation) from Qatar, we were able to bring the species back to Germany to our breeding facility for breeding purposes. After our successes in the Spix Macaw program, we are extremely happy to be able to contribute in another parrot conservation program of the Brazilian government, “ said spokesman of ACTP on FB page. The association got three birds from Al Wabra and as they informed a week ago, three more birds arrived to Germany on 3rd September. So at this moment, ACTP should have six birds in total. Association for the conservation of threatened parrots is not the only facility where Lear’s Macaws are kept. The most of captive population is kept and also bred in Loro Parque. They have been really successful with this species for several years and their offsprings should go to ZOO Wuppertal and ZOO Prague in following years. There are also some individuals kept in private facility in Switzerland. We can’t forget about Al Wabra in Qatar, of course. Because at this place, several youngers have been bred in the last years. Title photo: (c) jquental. This file is licensed under the Creative Commons Attribution 2.0 Generic license.